So how does this revolutionary drive concept work? On all previous transmission types, whether manual or geared automatic, specific transmission stages are physically present inside the transmission casing, in the form of five or more pairs of gears or planetary gear trains. 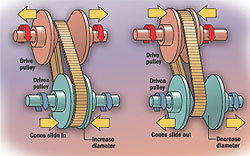 On the continuously variable transmission, however, there is just one pair of sturdy gears with a flexible transmission belt, which permits an infinite number of transmission ratios. This central component is known as the Variator: a transmission element resembling a V-belt connects two axially adjustable sets of pulley halves. By adjusting the spacing between them in line with the circumference of the tapered pulley halves, the transmission ratio of this belt drive arrangement can be varied across a wide range. As the belt is a highly stressed component it must be very strong and grip very well. Most CVTs now are using a metallic belt developed by Netherlands van Doorne Transmissions BV. It is sufficiently strong enough to be able to transmit much higher torques and forces than rubber belts. Through years of testing this type of chain has proven extremely reliable and guarantees lifelong durability. It consists of hundreds of transverse metal plates and longitudinal metal tapes. The transverse plates are used to grip the pulley and the longitudinal tapes hold the plates together and take the strain. One fundamental advantage of the Variator in the CVT is the high spread of ratios. This means the difference between the largest to the smallest transmission ratio is – 1:2.1 to 1:12.7. This relationship of over 1 to 6 is close to the ideal value for transmissions. This on the one hand permits dynamic, sports-style acceleration thanks to the use of the highest possible ratio, and on the other hand fully exploits the engine's potential for economical operation by using the lowest ratio. In combination with the modern Electronics and an hydraulic torque converter or hydraulic controlled clutch it works even better than a normal automatic transmission. A further special feature is the ability of the electronics to emulate the functions of a manual gearbox. Nissan and Audi have opted for six forward speeds which can be selected by the driver with a single touch of the selector lever in the second gear shifting plane, or activated at the push of a button on the steering wheel (optional extra on some models). These six speeds are stored as fixed gearshift programs. Depending on which speed the driver selects, the controller is supplied with the ratio as a set point, which it establishes at the Variator and maintains. Even these manually prompted gearshifts are pleasantly smooth and jolt-free, without any interruption in traction, all the while satisfying the desire for sports performance thanks to their continuous adaptation.